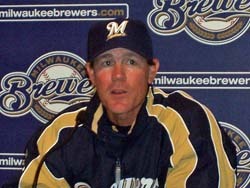 Milwaukee Brewers owner Mark Attanasio told a Milwaukee newspaper yesterday that Ned Yost&apos;s job is in tact for next season. Yost is signed through 2008 with an option for 2009. GM Doug Melvin told the Milwaukee Journal Sentinel that there never was any thought internally that an official announcement was needed to say Yost would be back next season.